The sweet and salty balance from raisins and olives make this dish addicting. Then the couscous adds complexity. It is cooked in fresh-squeezed orange juice, zest and cinnamon. 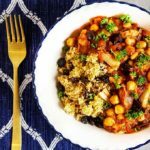 I like using a rotisserie chicken for a low-prep weeknight dinner, or I replace the chicken with an extra can of chickpeas for an easy vegetarian version. Also, I recommend having extra olives and raisins on hand, in case you want to add more to garnish your dish. Chop the onions, mince the garlic, and shred the chicken. Zest the oranges, then squeeze juice from them into a liquid measuring cup. If you have more or less than 1 cup, that is fine. Chop the olives. Heat olive oil in a dutch oven or large soup pot. Add the onions and cook until soft (7-10 minutes). Add garlic and oregano and cook for 1-2 minutes until fragrant. Add crushed tomatoes, chickpeas, broth, bay leaves, a tiny bit of salt and pepper. Bring to a boil and then simmer for 15 minutes. While this simmers, make the couscous. Bring the olive oil, 1.25 cups of liquid (a combo of orange juice and chicken broth), zest and salt to a boil. Add cinnamon to liquid and stir it in. Then add couscous and raisins. Stir, remove from heat and let the couscous absorb the liquid for 5 minutes. Taste for seasonings, adjust as needed. Test chickpeas and continue to cook until they are to your desired softness. This might take another 5-10 minutes. When chickpeas are ready, or almost ready, add in chicken and olives. Simmer until they are warm. * I use leftover rotisserie chicken, about 2.5 ounces a person. ** Juice the oranges, and then add chicken broth to end up with a total of 1.25 cups of liquid for the couscous. 67% of your daily recommended protein is covered in this recipe. 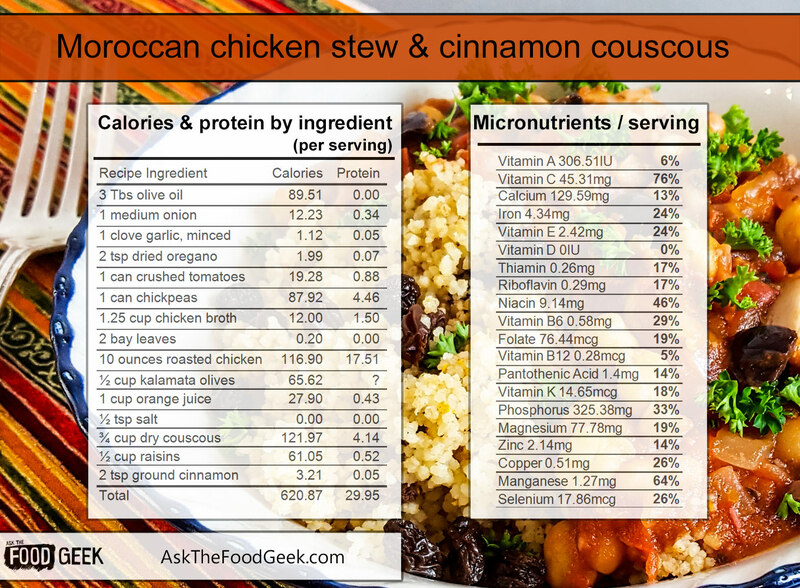 2.5 ounces of chicken per serving gives 17 grams, the chickpeas and couscous add about another 4g each. Sodium levels are a bit high in this recipe. The big contributors are canned chickpeas (use dried ones and soak overnight + precook to keep them low in salt). The olives are also high in sodium. There is zero added sugar in this recipe. Chicken: use part of a rotisserie chicken, or leftovers from another dinner. Uncooked couscous will increase in volume by 2.5-3x when cooked. So 3/4 of a cup uncooked will turn out to be about 2 cups cooked. Oranges will last a week on the counter or a couple of weeks in the fridge. 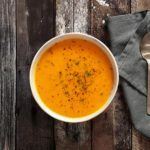 So you can easily buy ingredients for this ahead of time and make it at the end of the week or even the following week. Olives: save time and buy pitted olives. I actually got this from a friend a long time ago. I lost it. After a lot of searching, I found one from The Kitchn and it was a near match. 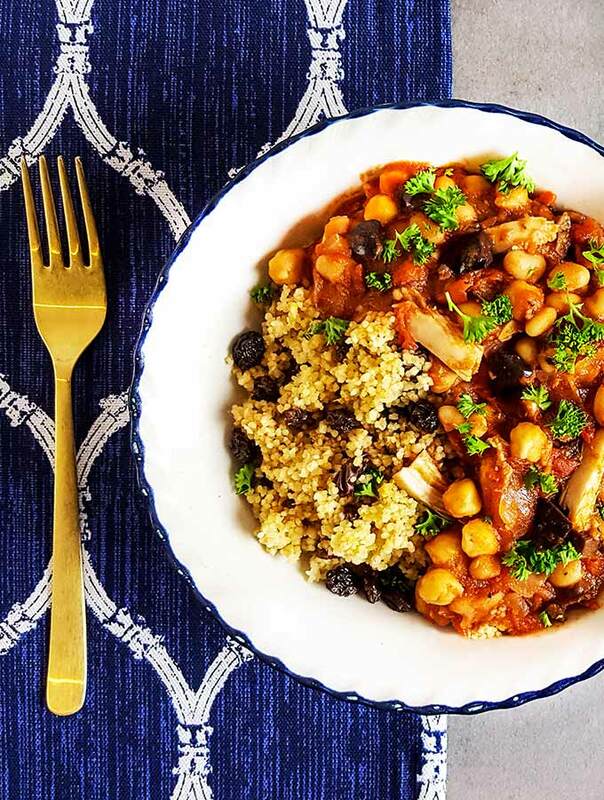 I only made small changes – the main one is that I suggest cooking the couscous in the orange juice (with some zest) instead of adding it later.